It’s always this time every year when it’s blueberry season in Maine. It’s not a long season, so I make sure that my freezer is stocked up. Maine blueberries are small and sweet, unlike it’s New Jersey cousin who is bigger. Every year I tell myself that I am not going to run out of blueberries. I have so many new ideas for baking. Make sure you check out my recipes for my award winning Blueberry Skillet Cake (It’s like an upside down blueberry cake) and Blueberry Muffins, they are made with brown butter and have a crumb top, so perfect! 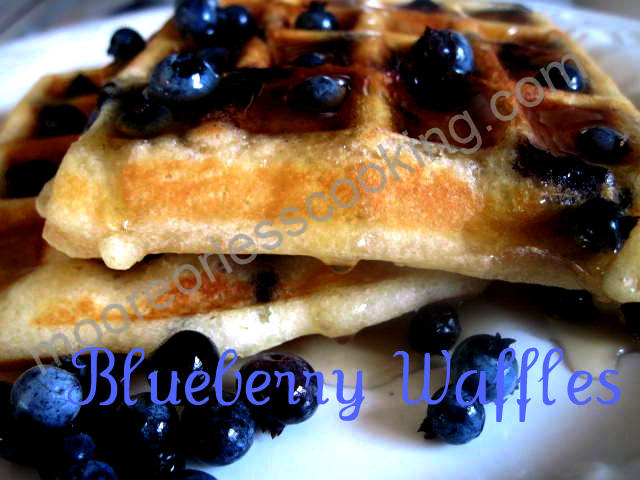 So when Pop’s wants to make his famous Griddlecakes, I hold on to my precious blueberries and tell him, there are so many recipes I would like to try, Blueberry Waffles being one of them, he agrees! Light, fluffy, blueberries bursting in your mouth, good morning delicious! Please use real Maine Maple Syrup on your blueberry waffles if you have it, you will be so happy that you did! I a bowl, whisk flour baking powder, sugar and salt. Mix in eggs, milk, shortening and butter. Gently fold in blueberries. Spray a waffle iron with Pam. Place a 1/2 cup of batter on each side of waffle maker. Cook in a waffle iron until brown and crisp. Your photo of those blueberries floating in those maple syrup filled waffle dimples, makes me want to dig out the waffle iron right now!